Kelly Madigan is a ghostwriter – for cookbooks. 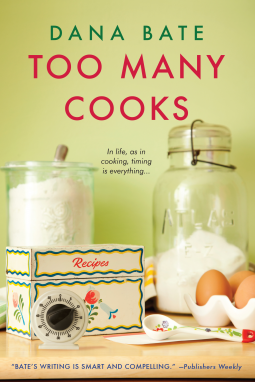 Reading Too Many Cooks, I loved living the life of a cookbook writer for a while. Kelly tested recipes in a fabulous London kitchen, bought produce from street markets, and rubbed elbows with a movie star and her British politico husband. My favorite part was the food! Kelly had to refine recipes to perfection. Though it may have been tedious for her to repeat recipes, it was pretty mouth-watering for me. Breads, soups, burgers, fries… Even the leftovers sounded good. There’s a little “love” story in here, but the book is mainly about Kelly gaining confidence, finding direction, and making her own way in a world that caters to those in the spotlight, not those behind the scenes.